Do you love to fish? We do, too! The Isle of Palms is an excellent location for fishing. In fact, our ocean waters are teeming with so many fish that several local fishing charters have decided to set up shop and call the Isle of Palms home! While fishing can certainly be as simple as casting a line from the pier, fishing charters are a wonderful way to take your experience to the next level. Not only will you visit some of the best spots to fish, but you’ll also learn about the history of the area from an experienced and knowledgeable guide. Are you interested in trying it out? Here are a few of the best Isle of Palms fishing charters! If you’re planning a trip to the Isle of Palms, begin by accessing our free Vacation Guide! It’s packed full of information to make your trip planning easier. Inside the guide, you’ll find the best places to eat, fantastic shops to explore, and great activities to do on your getaway – like Isle of Palms fishing charters. In the hands of Captain Shane Ziegler, you’ll have an awesome fishing adventure at Barrier Island. Whether you’re an experienced angler or this is your first time fishing, Barrier Island is a great fishing charter. They provide you with the equipment that you need, and you’re practically guaranteed to catch some kind of fish! The Charleston Fishing Adventures tries to make every experience unique and special to their visitors. They work hard to tailor the trip to your wants and needs as a fisherman. The captains employed here love to teach all skill levels, from golden oldies fishermen down to the fresh-faced youngsters. They offer a variety of excursions including inshore, offshore, and nearshore fishing. A great charter option for you and your family! Hotfish Charleston offers over 30 years of fishing experience to interested customers. The boat is powerful enough to get you to your fishing spot quickly. At the same time, it’s quiet enough that you won’t scare the fish away. Explore inland Charleston shore for Redfish, Black drum, and Spotted Seatrout. As always, you’ll not only get a fun fishing experience but also expert lessons and fishing advice from the seasoned fisherman Captain Mike. 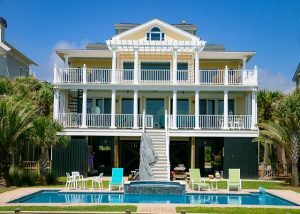 The best way to experience the Isle of Palms fishing experience is to rent the perfect Charleston vacation home. Whether you are looking for a cozy home for you and your family or a house big enough for all the relatives or group of friends, East Island Rentals has a vacation home perfect for you. Enjoy our luxury rentals with our top quality guest services. We also love to provide tips and advice to make your time in the Lowcountry that much more memorable. Not interested in an Isle of Palms fishing charter and want to rent a boat instead? We got you covered! We can’t wait to help you plan your Isle of Palms adventure! Check our availability and contact us to start planning your getaway today.